CSB investigators visited all three sites impacted by the April 3rd incident: 1) Faultless Linen; 2) Pioneer Industrial Corp.; and 3) Loy-Lange Box Company. While early media reports were calling the equipment involved in the incident a “boiler,” the vessel that launched into the Faultless Linen building was a hot water storage tank also called a semi-closed receiver or SCR. This tank was part of a steam generator system that serves the same purpose as a boiler, but is of a different design. The SCR launched out of the Loy-Lange facility and into the Faultless Linen site, crashing into an office area. An initial examination found that the vessel appears to have landed top down into a room where three people were present. The three people in the office room were fatally injured. One worker at the the Loy Lange Facility was killed and a second remains in ICU. The structural integrity of the Faultless Linen office area is still being assessed. The failure mode of the SCR is unknown. Currently, it is too dangerous to enter the room to conduct an in-depth examination. The CSB has begun discussions with the appropriate entities on site to remove the equipment to allow forensic examination. 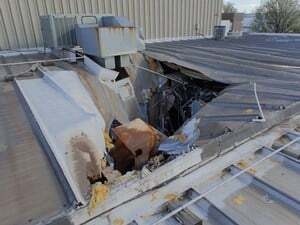 An initial assessment also found that an approximately 12.5 foot long pipe, which had been attached to the SCR, crashed through the roof of the Pioneer facility. It stuck in the roof and punctured an office ceiling, where it remained until the company removed it to temporarily re-roof the hole to protect the building from water damage. Structural engineers retained by the CSB determined that the Loy-Lange site is not safe for CSB entry at this time. CSB investigators have photo-documented the perimeter. The CSB is coordinating its investigation efforts with local emergency responders and other federal agencies and investigative entities. CSB investigators are likely to remain on site for the next several days. Additional updates will be provided as the investigation develops.